MailChimp, by default, requires a double opt-in process for subscribers to join a list. MailChimp uses this feature to avoid lists being cluttered by spammers and invalid e-mail addresses. In some instances, though, the double opt-in feature can lose new subscribers if the opt-in e-mail isn’t confirmed or if the e-mail gets sent to the spam or bulk folder. This article will show you how to disable the MailChimp double opt-in using WordPress. The signup form is filled out and the information is sent to MailChimp. The new subscriber receives a confirmation e-mail with a link to confirm the subscription. The new subscriber is added to the list and an optional welcome e-mail is sent. There are often reasons why the double opt-in isn’t necessary. Unfortunately, MailChimp doesn’t have a way for you to disable it easily, especially if you are using WordPress and the MailChimp List Subscribe Form plugin. Fortunately, there is another free MailChimp plugin that will allow the double-opt in to be disabled. It is called Contact Form 7 MailChimp Extension. The Contact Form 7 MailChimp Extension plugin integrates with Contact Form 7 and uses the MailChimp API to transmit subscriber information. NOTE: Setup instructions for the plugin can be found in the article How to Create a Sales Funnel with WordPress, Contact Form 7, and MailChimp. 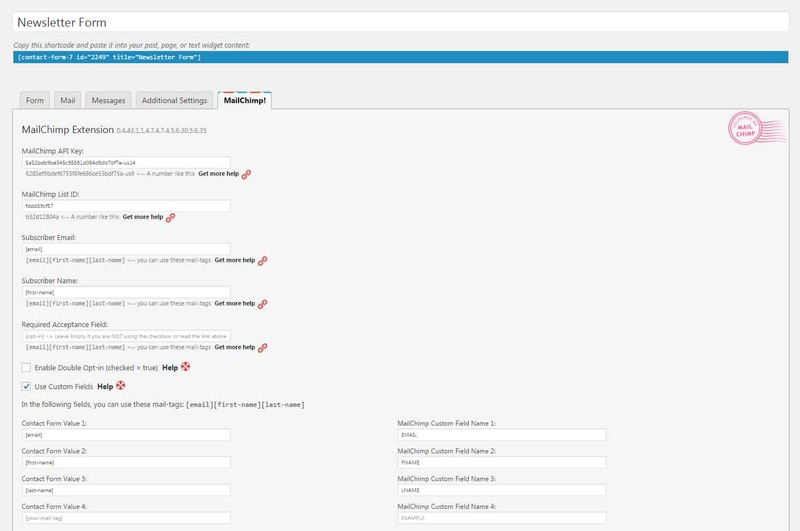 Once you have the plugin installed and have correctly added the MailChimp API Key, MailChimp List ID, Subscriber Email, and Subscriber Name, leave the Required Acceptance Field blank. Also, leave the “Enable Double Opt-in” field unchecked. This will disable the double opt-in feature with MailChimp. When the form is filled out the subscriber will be automatically added to the MailChimp list and the confirmation e-mail will be skipped. You may want to set up the final MailChimp welcome e-mail because MailChimp disables it by default. You could also use Contact Form 7 to send the welcome e-mail as an alternative. By using WordPress, the Contact Form 7 plugin, and the Contact Form 7 MailChimp Extension plugin, you can easily disable the MailChimp double opt-in process. This solution works well if you are already using CF7 and would like to begin building to or add to an existing subscriber list.